this is the first time i used it, the carving on the bench is love, btw in very early stage. 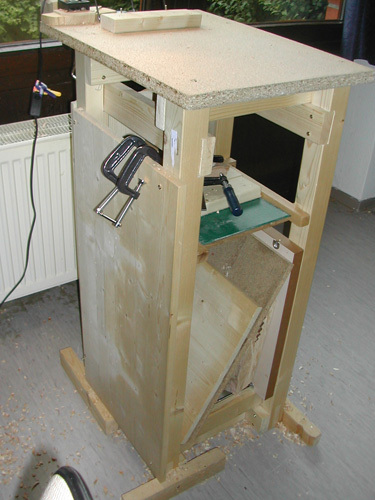 the area below i used to put wood inside, so its function is storage and give additional weight to the bench. 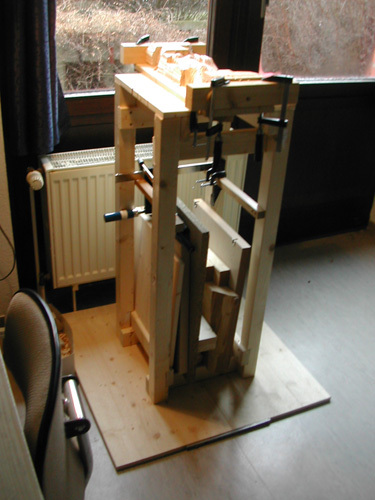 …i removed that board (oh that was work, i had fixed it with 40 screws…), and put the boards on the side for more stability, and put some wooden blogs besides the legs in a windmill fashion to enlarge the standing area. 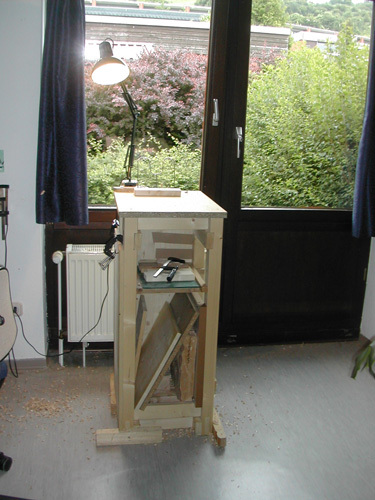 furthermore, i found 40x40cm workarea too small still, and replaced it by a plywood 42x60cm. i added a small shelf (green) for putting things. 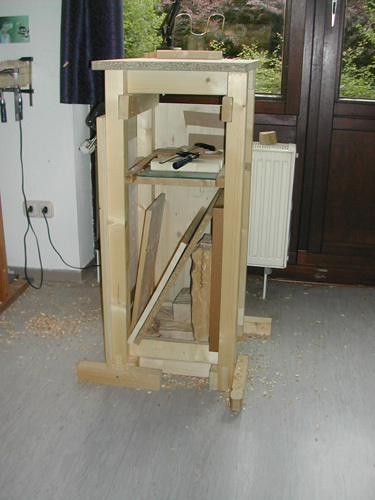 now the bench is truly sturdy, and with the wood in the lower shelf it is heavy enough to stay still even under heavy mallet work. right side of bench is open. i have a bookrest installed at the workarea, that is the green thingy,,,ah no i do not read while carving, but i put m references there so i have them to look all the time. 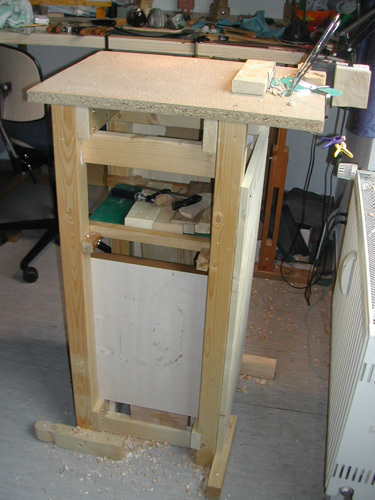 … and i have made an armature to hold a lamp with a swinging arm at the end of the workarea. the backside is closed with a wooden board. 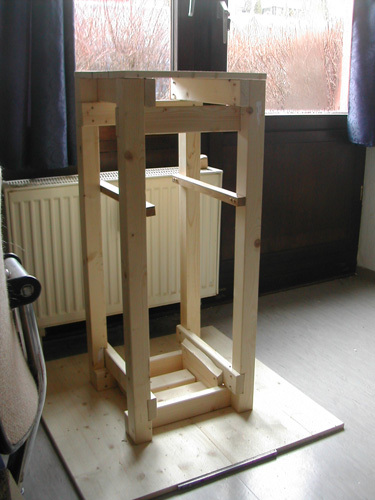 so i hope this inspires you to try building yourself a small bench when you have no space for a shop or a big bench … and, the weight of the empty bench is still low enough that one can carry it, for example outdoors to carve in fresh air or into a closet after carving to remove it from view if that is wished…. Great work though – I’ve followed your carvings for a little while now and your works never fail to simply astonish me. Aye Doris that might be the way for me to go. As I age I find holding the bigger carvings by hand can be tiring. I ordered a Veratis vise from Axminster. The old Workmate I have can be hightened so I’ll try that first with the vise mounted. If that is unsatisfactory I’ll look at this idea again. hello john, i believe you will experience much more pleasure in carving when you fix the piece instead of holding it by hand. first, as you said, it is tiring to hold by hand. but more important to me is, you get both hands free if you fix the piece somehow, and this freedom of hands gives you so much more control over your tools, you will find your tools seem sharper, and you can do much more accurate cuts, cuts which travel the path you really intended and end where you wanted them end… so, i am glad you start with a vise. i don´t know this one, but i am sure it is good direction…and the bench,,,mine is nice, but it has transformed over time already, since i like to improve it all the time.,,so, in case you look my idea, take what you feel is good for you, and change all other to your needs. i am glad if i could inspire you. My imitial results are good. I’ve two carvings I roughed out on the vise and it appears to be easier physically. However early days yet.